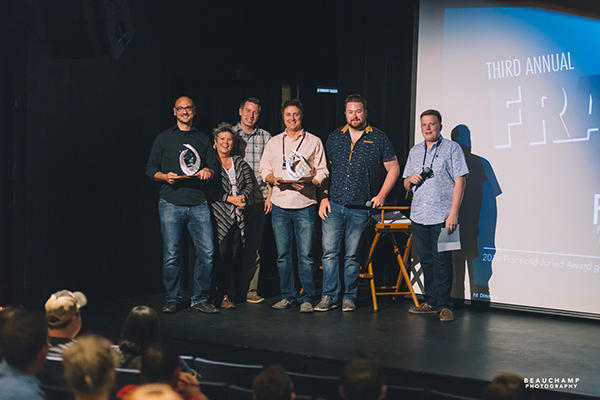 Congratulations to the award winners of the 2016 Reel Shorts Film Festival! 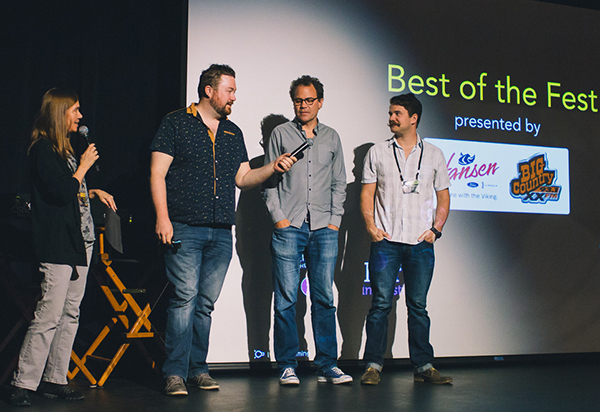 These films were showcased in the Best of the Fest package presented by Big Country and Hansen Ford Lincoln. For a pdf of the 56-page program, click here. You can watch two of the award-winning films below! Best Animated Short – The OceanMaker, a 10-minute film from Belize and the United States written, produced, and directed by Lucas Martell and produced by Christina Martell. Above, Chris Wall of Hansen Ford Lincoln presents Lucas (left) and Christina with their award. Scroll down to watch their film. 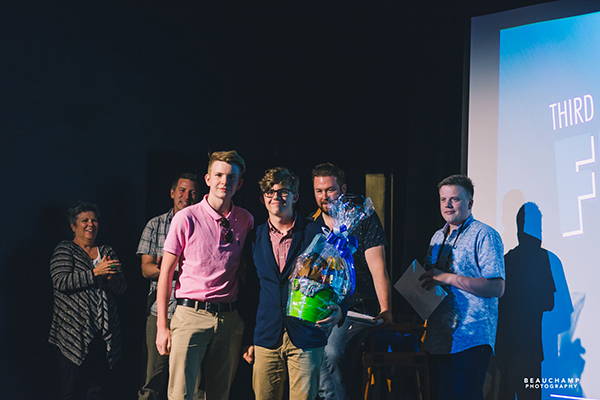 Best Peace Region Short – The Souvenir, a 7-minute film written, produced, and directed by Chris Beauchamp (from right to left in the photo below) and Gordie Haakstad. 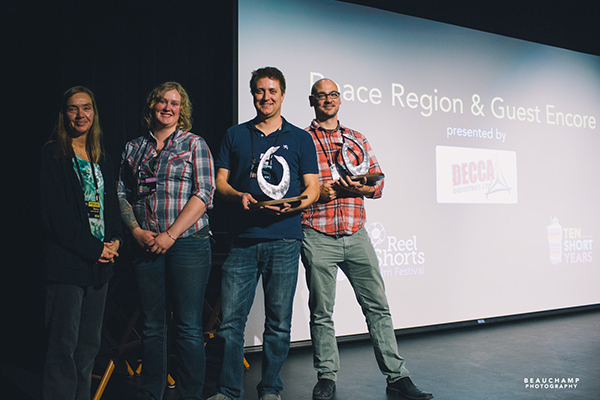 The award and a $250 cash prize were presented by Erin Wells (second from the left) at the Peace Region & Guest Encore package presented by Decca Industries. Erin made all of the juried and audience choice awards from 3/4″ aluminum on Decca’s waterjet cutting table. Youth Audience Choice Award – Dji. Death Sails, a 5-minute film from the Republic of Moldova directed by Dmitri Voloshin. See below to watch his film. 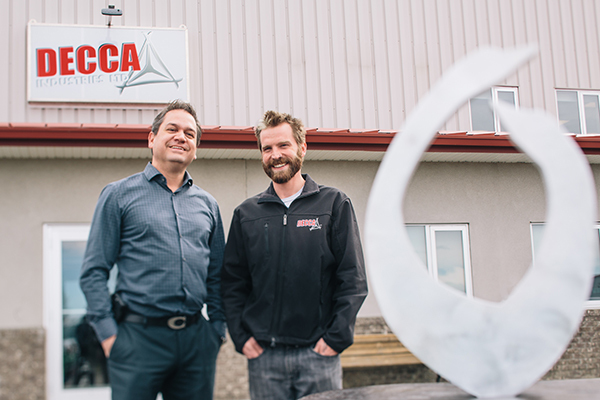 Grande Prairie sculptor Grant Berg (left in the photo below) designed the award that winners receive. On the right is Mack McDonald of Decca Industries in Clairmont who turned Grant’s vision into reality. The base was made by D.R. Sales Woodworking in Grande Prairie, so in every respect it’s a creation of the Peace Region like the film festival itself. The design reflects the fact that the festival takes place in Grande Prairie which is known as the Swan City because trumpeter swans return to the city and surrounding area every spring to nest, and its flame shape symbolizes the passion of the people who put on the festival every year and the filmmakers whose work we celebrate. 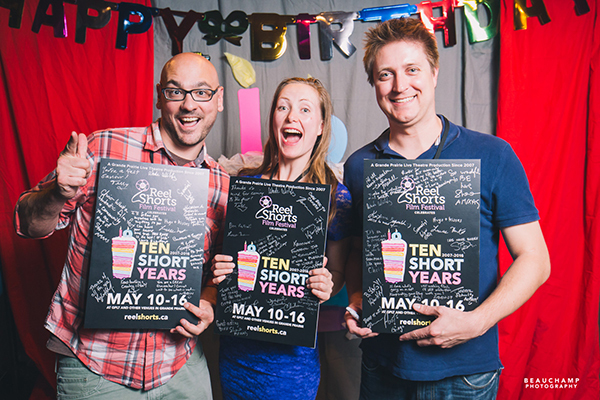 Thanks to all of the funders and sponsors who made the fest possible, and thanks to everyone who came out and made our 10th festival the best one yet! Below, filmmakers Chris Beauchamp (left) and Gordie Haakstad (right) with Skinless (Hudløs) Actress Kristiane Nerdrum Bøgwald from Oslo, Norway display their posters which Chris designed. A huge thank you to Laura Beauchamp for the photos! Oscar Shorts on Valentine’s Day! Programming Process – Part II: How do we evaluate films? Programming Process – Part I: How do we find films? 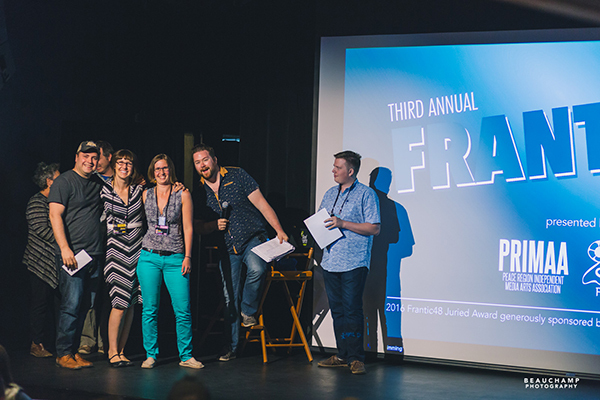 Visit Grande Prairie for the 2019 Festival! Copyright 2019 Reel Shorts Film Society.